We last experienced the myriad influences WHOOP-Szo bring together when they appeared on Exclaim! TV. Now audiences on both coasts will be able to take in their eclectic sounds this summer with an extensive Canadian tour. 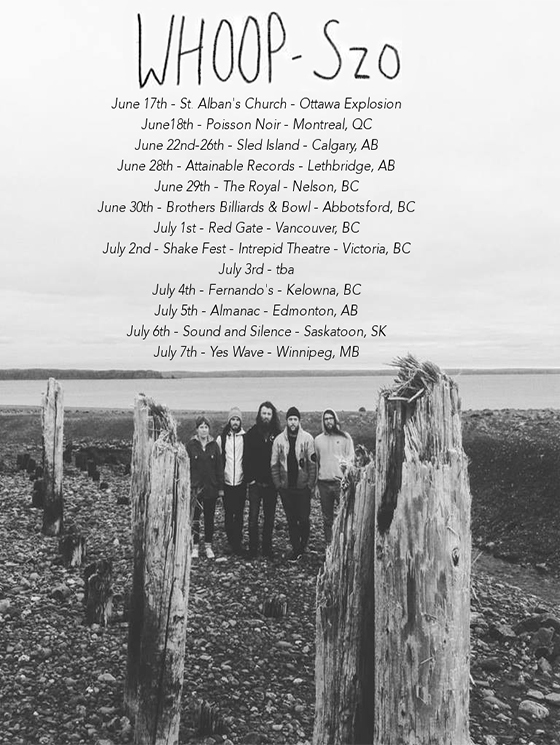 Starting tonight (June 17) in Ottawa with dates in Montreal and Thunder Bay to follow, the band will head to Calgary where they have a number of performances lined up for the city's Sled Island festival. From there, it's onward through Alberta, British Columbia, Saskatchewan and Manitoba before they end up out east near the end of July. Following some Maritimes shows, everything will then wrap up back in Ontario. Along with the tour dates, the band have shared an unreleased track in "Bmaadiziwin," which will be available on cassette and digitally. The song title is an Ojibwa word that represents a spiritual way of life, translating to the "good life" or "a healthy way of living." Take a listen to "Bmaadiziwin" below, where you'll find the band's lengthy tour itinerary.